The first weekday of the New Year began on a tragic note for several families of Ambala district, as 11 children died when their overcrowded school van (Tata Magic) collided with a truck on the Saha-Shahbad Road (about 20 km from here) this morning. The van driver, Subhash (25), was also killed in the accident. Uday and Drishti, students of Arjun Public School, situated 3 km from Pasyala village, were lucky to have missed the school van today. As they got late in getting ready for the van, their father decided to drop them on his motorcycle. Balkar Singh cursed his fate as he waited and wept outside the emergency ward of Government Medical College and Hospital, Sector 32. He lost his 15-year-old nephew in the school bus accident. His daughter and niece are battling for life in the hospital. Petrol prices will not be raised this fortnight as state-owned oil firms apparently could not get political clearance for the over Rs 2 per litre hike in rates needed to achieve parity with the imported cost on account of the weakening rupee. Indian Oil and other state-run firms are not raising the rates even this fortnight, a government source said. Existing edgy relations between India and China went over another unexpected hump today as New Delhi lodged a strong protest with Beijing after an Indian diplomat, S Balachandran, based in Shanghai, was ill-treated and had to be hospitalised. 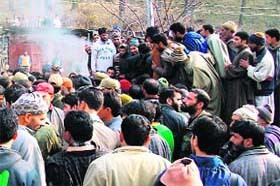 A student was killed and two others injured when jawans of the Central Industrial Security Force (CISF) opened fire to disperse a mob protesting against power shortage outside the NHPC-run Uri power project at Boniyar in Baramulla district today. Appeals have been filed in the Supreme Court challenging the Punjab and Haryana High Court�s December 20 order directing the Haryana Vidhan Sabha Speaker to take a decision before the end of April this year on the plea for disqualification of five MLAs for allegedly defecting from Haryana Janhit Congress (BL) to the Congress in 2009. The BJP today released its first list comprising 19 candidates, retaining most of the sitting MLAs. However, the party�s central parliamentary board, which met here tonight, dropped two-time minister Master Mohan Lal and allotted the Pathankot seat to Ashwani Sharma.